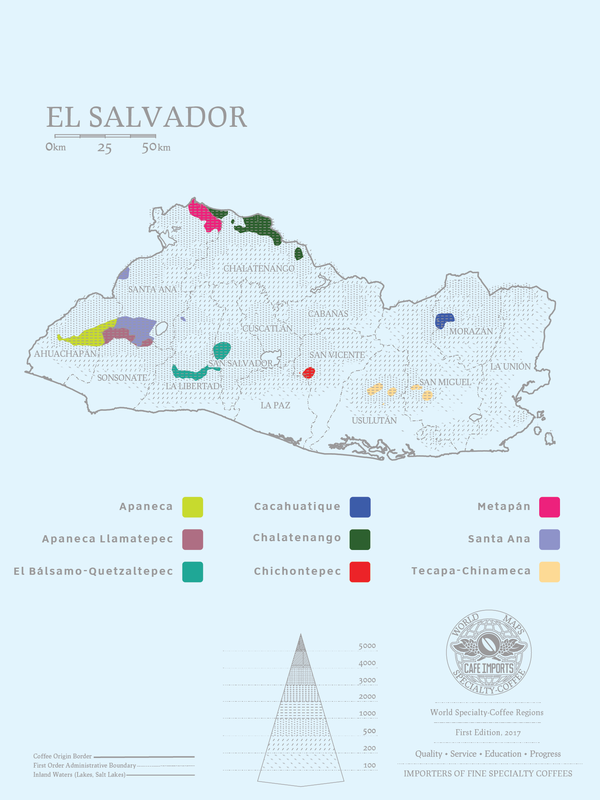 Unfortunately, one of the things that has set El Salvador apart as a coffee producer over the past 20 years is also what’s made it very vulnerable: Those famous varieties, often grown in monoculture, are especially susceptible to coffee-leaf rust. Bourbon, in particular, is not hardy enough to battle the disease, and as Pacas and Pacamara both spring from Bourbon genetics, the country’s crops have suffered under the latest outbreak of coffee-leaf rust in the 2010s, causing both quality and yield to fall. More recently, extension services provided by Centra-Cafe through the national coffee institution (Consejo Salvadoreño del Cafe, founded 1989) have worked to fund research, offer financial and agricultural support to producers, and continue to aggressively market Salvadoran coffee as both unique and accessible, with character in the cup as well as in its legacy. As El Salvador continues to bounce back after the devastating effects of coffee-leaf rust, farmers are committed to trying to preserve as much of their heirloom varieties as possible, to mixed results. With yields down as much as 50 percent in places, it is a time of crossroads for Salvadoran producers, who face difficult decisions about what plants to cultivate in the incredibly rich volcanic soils. One of Café Imports’s green-coffee buyers, Piero Cristiani, is from El Salvador, and his mother has been involved in the coffee industry for decades, imbuing Piero with a special passion for discovering and highlighting the best coffees the country has to offer. He is based in El Salvador for a portion of the year, which allows him to develop and maintain strong relationships there, and to keep an eye on the quality and volume of coffees year by year. Thanks to his vision and initiative, we have been able to buy coffee in parchment and do the dry milling and final sorting ourselves, which not only provides more up-front finances for producers but also allows us to offer a range of coffee lots that are separated by process, variety, and even screen size, as we’ve had success with blended peaberry lots from various quality-focused growers in the Chalatenango region in particular. Of course, we also have more standard single-producer microlots, and are also working toward more Regional lots and perhaps even a version of our Best Cup competition to contribute to the strengthening of Salvadoran coffee for generations to come.